This peak is #18 on the Height List for Nevada . 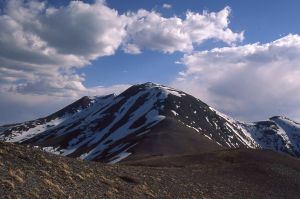 This peak is #60 in Prominence List for Nevada .Bunker Hill is located in the center of the Toiyabe Range in central Nevada. The north ridge is the normal route, a scree and bush route. Reaching the ridge may require some route finding around cliff bands.